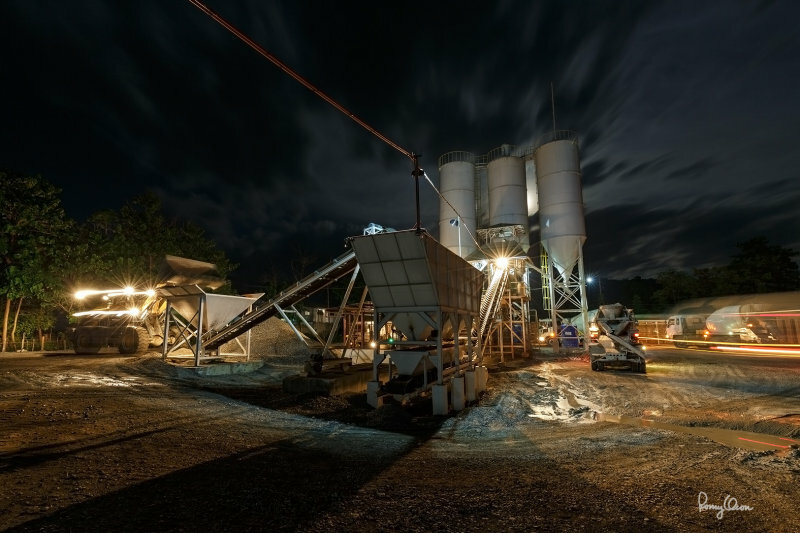 I was observing the production of concrete at Ten-Four’s ultra-modern batching plant in Rosario, La Union (Philippines) recently, as it supplies the basic building material to the on-going construction of the Tarlac-Pangasinan-La Union Expressway (TPLEX). At about half past 7 in the early evening, the moon rose in the east beyond a hill. I thought the moonlit sky above the cement silos, coupled with the dynamism of heavy equipment in full operation at night, would provide a photogenic moment. I quickly set up my 5D MIII + EF 16-35 f4 L IS on top of a tripod and gear head and took several frames with long exposures. The image posted below is my favorite of the bunch. I chose a Tv of 30 seconds to capture light trails and equipment motion blur, as well as to properly expose the darkish areas of the scene. An Av of f/9 assured enough DOF to render near and far objects sharp, while an ISO of 100 gave me optimum dynamic range and least noise. I do most of my photography in the supertelephoto realm, but its amazing sharpness from edge-to-edge is quickly turning the EF 16-35 f4 L IS into one of my favorite lenses. manual exposure in available light, tripod/gear head, AWB, near full frame resized to 800 x 533 pixels.